“It makes me sad that my baby was born in a tent and will live in a tent,” said Shereen Sabah. 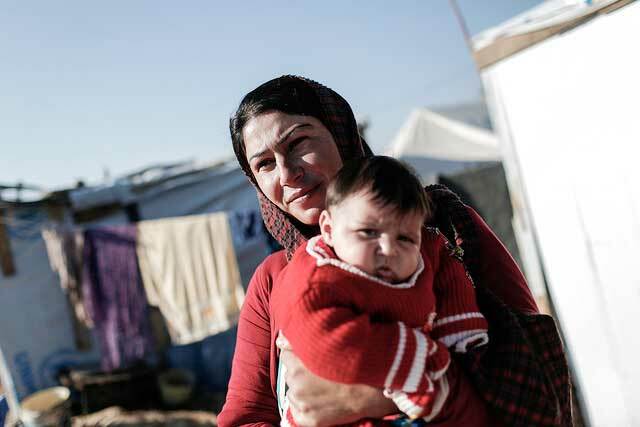 She was five months pregnant when she fled ‘Islamic State’ (ISIS) extremists who overran the Sinjar area of northern Iraq in August. She is part of the Shabak community, one of the minorities targeted by the militants along with Yazidis, Christians and some Muslim sects. The family have been registered to receive winter assistance from Caritas, who are helping about 10,000 people from north and central Iraq. “We’re always discovering new pockets of people,” said Thomas Hoerz, humanitarian advisor to Caritas Iraq, seconded from Caritas Germany. “My family is six people and I’m the only one who works, so we really need these things,” said Amr Hermez Adem, who received a heater, blankets and bed sheets as part of a Caritas distribution. Families are also given a carpet, a blanket, one bed sheet per family member and a heater with three months of fuel. The families receive hygiene kits and kitchen sets that include a simple stove and kitchen utensils. “On the first night that we arrived there was nothing here. It was summer then, so we slept on the ground, some of us slept in our car. We are still afraid that Daesh (ISIS) might come and attack us,” said Elias Paulos Mati, one of the many Christians who fled ISIS. Like the vast majority of the families, his left their home in the middle of summer, expecting to be gone for a short time and are thus ill equipped for the harsh cold of winter in this area. The family now live in Mangesh, near Dohuk. Caritas Iraq, in partnership with US member CRS, has helped over 1000 displaced families here by donating cash and coupons to them. The average value is around $400 per family and is used to buy winter clothes, blankets and bedding. Elias’s young grandchildren Daniel, Lavina and Julianne have all received clothes thanks to the donations. “I didn’t have a jacket so when they bought it for me I felt happy – I used to have one just like it back home,” said Daniel. “I feel warm and comfortable in my new clothes,” said Lavina. “We’re very grateful to Caritas, they gave us what we needed and in time for winter,” said Elias. Caritas has also repaired previously disused buildings so people can live in them. He shares a house with his five sons, their wives and children in the village of Kindala near Zakho. The family had their windows fixed, their roof repaired and re-sealed and a rudimentary sewage system installed. “Caritas arrived and started supplying us with materials. They gave us the blankets, the mattresses and even this carpet. They even gave us clothes and bed sheets. We came here with only the clothes we were wearing but thanks to God and to Caritas we now have winter clothes,“ he said. The Dorbo family are Yazidis from Sinjar. Now they live in Shariya, near Dohuk, in a partially constructed house. Here Caritas, in partnership with CRS, has helped over 1000 families by supplying tools, resources and expertise to fix up homes to help them through the winter. “There were no windows, no doors, nothing. Before it was very cold. We tried to cover the windows with wood and plastic bags but it didn’t work very well. We would just huddle under our blankets to keep warm,” said the father, Daoud Dorbo.